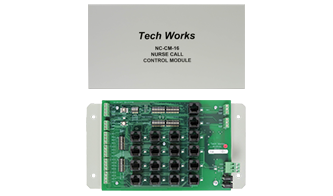 The Tech Works NC-CM-16 is the modular central equipment that monitors and powers up to 16 patient room call points. Each control module converts the status of call points to our RS485 Network Communication. Each Control Module is addressable on the Tech Works Network using a rotary switch to select one of 16 addresses. So 16 Control Modules, each monitoring 16 Patient Room Call Points is 256 Rooms per system. The NC-CM-16 is designed to monitor the NC-DL-12 Dome Lights. Each Dome Light has circuitry to monitor two calls per room; Normal and Emergency. Each Dome Light has a “Signal” output that reports the status of that Dome Light to the Control Module by an Individual “Station Signal” wire. The Signal wire can be supervised for proper operation to each Dome Light. Supervision can be turned off globally in software by an “Option” dip switch. Unused inputs can be placed “Out of Service” by an individual dip switch for each input. Built in Station indicator lights tell the installer the status of all call points at any time. Two wiring options are included on each NC-CM- 16 Control Module. Wire can either be run as a Buss Loop with an individual home run wire for signaling or as multiple home runs of CAT5, one from each room. Two sets of connectors are included. The Control Module also includes “Zone” output terminals or CAT5 connectors for adding up to two Zone Lights or Duty Stations. Each Zone output is dip switch selectable to display any combination of the 16 Room signals.